As the initial release for Shout Select, a new line from Shout! Factory of films that have a deep fan following and are deserving of a collector’s edition, The Adventures of Buckaroo Banzai Across the 8th Dimension is an excellent choice. 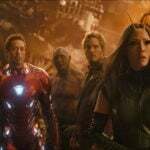 Part science fiction, part comedy, and part superhero film, the movie is filled to the brim with plot and terrific character actors, including John Lithgow, Jeff Goldblum, Christopher Lloyd, Pepe Serna, Clancy Brown, and Peter Weller in the title role. Plot: Adventurer/surgeon/rock musician Buckaroo Banzai and his band of men, the Hong Kong Cavaliers, take on evil alien invaders from the eighth dimension. In the summer of 1984, I glimpsed a trailer for what looked like a very interesting but very different movie during the Summer Olympics. I couldn’t tell quite what it was about, but I wanted to know everything about The Adventures of Buckaroo Banzai Across the 8th Dimension. A few days later, I found the novelization written by Earl Mac Rauch (who also wrote the screenplay) at my local bookstore and snatched it up. It was a fascinating read, and made me even more anxious to see the film. Announced release dates came and went, until it was finally announced that it would play in just a handful of theaters in the Philadelphia area, and radio station WMMR would host a screening of the film the night before it would open to anyone who picked up tickets at the station before they ran out. I drove into the city and picked up a ticket, and that evening, it was love at first sight. So much so, that I dragged a few of my friends to a Sunday matinee that same weekend. To explain Buckaroo Banzai is almost impossible. Buckaroo (Peter Weller) is a neurosurgeon, a physicist, a rock star, and the subject of a series of comic books that fictionalize his adventures with his team of experts known as the Hong Kong Cavaliers and volunteer Blue Blaze Irregulars. After a successful test of his Oscillation Overthruster in the desert, which allowed Buckaroo to drive his Jet Car through a solid mountain, Dr. Emilio Lizardo (John Lithgow), who was working on his own Overthruster back in 1938, escapes from the Trenton Home for the Criminally Insane. 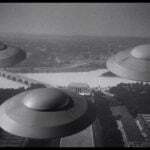 During his experiment in 1938, a Red Lectroid from Planet Ten, Lord John Whorfin, took control of his body, and now wants Buckaroo Banzai’s device so that he and his minions of Red Lectroids who are inhabiting aerospace contractor Yoyodyne Propulsion Systems’ facility in Grover’s Mill, NJ, can journey home and overthrow the Black Lectroids led by John Emdall (Rosalind Cash), who banished them to the 8th dimension for war crimes. While performing at a nightclub (I did mention he was a rock star), Buckaroo and the Cavaliers meet Penny Priddy (Ellen Barkin), who is the spitting image of Buckaroo’s late wife, Peggy. After her failed suicide attempt that is mistaken for an assassination attempt on Buckaroo, he takes her in, allowing her to stay in his quarters at the Banzai Institute. Hoping to get his hands on Buckaroo’s Overthruster, Whorfin dispatches three of his Red Lectroid henchman, John Bigboote (Christopher Lloyd), John Gomez (Dan Hedaya), and John O’Connor (Vincent Schiavelli), to retrieve it from the Banzai Institute, kidnapping Penny in the process, who happens to have it stashed away in her purse (unbeknownst to Whorfin). This leads to a showdown at Yoyodyne between Whorfin with his crew of Red Lectroids against Buckaroo with his Hong Kong Cavaliers and Blue Blaze Irregulars. But Buckaroo has been given a deadline, he must stop Whorfin from re-entering the 8th Dimension before sunset, or the Black Lectroids will simulate a nuclear strike from the US against Russia, thus starting World War III and hopefully killing off the Red Lectroids and Whorfin in the process. 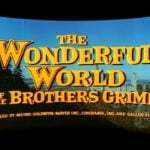 The movie ends with the promise of a sequel, asking the viewer to watch for Buckaroo Banzai Against the World Crime League, and when the movie failed at the box office, I was certain that any movie that promises a sequel during the end credits was doomed to fail. Of course, I based this on two other films that made similar promises previously and also failed, Doc Savage: The Man of Bronze and Doctor Detroit. Buckaroo Banzai is a film that most people either love it or hate it, and I think that has to do with how willing a person is to just sit back and enjoy the ride, and allow the confusing and overstuffed plot elements (and absurd humor) to just exist. The film is ripe with quotable lines (“Laugha while you canna, monkey boy!”, “No matter where you go, there you are,” “Lithium is no longer available on credit”), bizarre sight gags (“Declaration of War: The Short Form,” also pay close attention to Lizardo/Whorfin’s room at the Trenton Home for the Criminally Insane), and inspired performances by many actors who were just getting their start in the business. Lithgow practically steals the show as the crazed Dr. Lizardo/Lord Whorfin, with his ridiculous Italian accent that just makes his lines even more ridiculous. Weller seems perfectly comfortable in the title role. 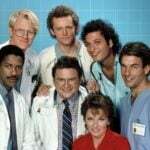 The supporting cast includes Jeff Goldblum as the newest Cavalier recruit, New Jersey, a brain surgeon; Clancy Brown as Buckaroo’s second-in-command Rawhide; Lewis Smith as Buckaroo wannabe Perfect Tommy; Pepe Serna as Reno Nevada; Carl Lumbly as Black Lectroid ambassador John Parker; Ron Lacey as President Widmark; and a very young Jonathan Banks as a hospital guard and orderly at the Trenton Home for the Criminally Insane. This release marks the first time Buckaroo Banzai is available on Blu-ray here in the US, and what a welcome addition it is. The film is presented in 1080p in its original theatrical aspect ratio of 2.35:1, and has been compressed using the AVC codec. The result is a much more film-like transfer than its previous DVD counterpart that was released by MGM. Colors are more vibrant without looking over-saturated, and the bright red costumes worn by Jeff Goldblum and Pepe Serna have no bleeding whatsoever (a major problem with all previous home video versions of the film). Detail is extremely well-defined, allowing viewers to read much of Whorfin’s scribbles on the wall of his hospital room. Film grain is evident and only becomes a minor issue on a few shots during the opening title sequence, otherwise it is generally never distracting. Black levels are also very good, with minimal crush that is barely noticeable in some of the darker sequences. There are, however, some instances of dirt and fluttering hairs in the image, but these are evident during many of the optically printed effects and title sequences, part of the technology of the day, and are likely baked in to the source material. Regardless, this is the best Buckaroo Banzai has ever looked. As with most Shout! Factory releases, two soundtrack options are available on this release, a 5.1 track and a 2.0 stereo track, both in DTS-HD Master Audio. As with the previous home video releases, both mixes are relatively front heavy. The 5.1 mix benefits from the discrete channels, providing a wider soundstage up front while offering a few discrete surround effects and an improved lower end. Dialogue is, for the most part, clear and understandable. Michael Boddicker’s synth-heavy score utilizes all of the channels, immersing the listener to his catchy theme and march (which still, to this day, has yet to be released). Shout! 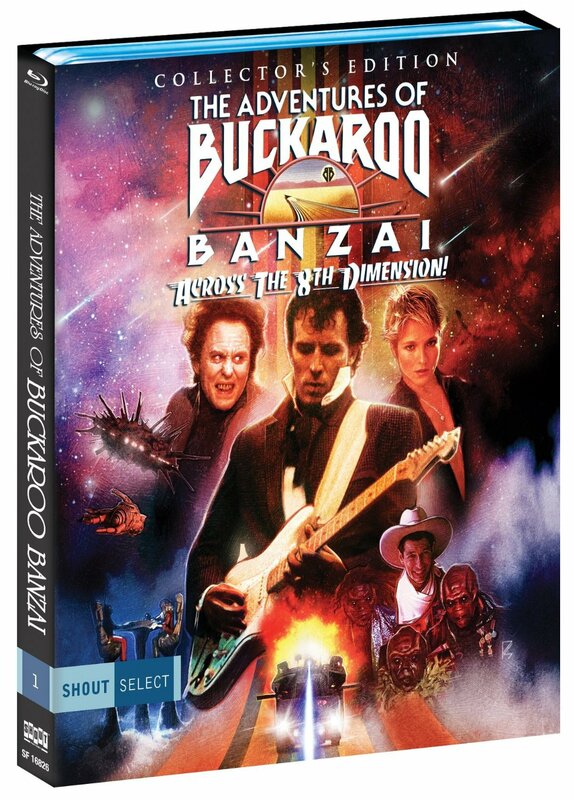 Factory has released Buckaroo Banzai as a 2-disc set, with archival bonus features on a DVD. Audio Commentary with Director W.D. Richter and Writer Earl Mac Rauch: This is the same commentary track from the MGM DVD release, with Richter stating the film is a docu-drama and Rauch pretending to be the real Reno Nevada. It’s a tiresome track that doesn’t go into any real details about the problems between the executives and the creative team during production. Audio Commentary with Michael and Denise Okuda: The Okuda’s are huge fans of the film, and in addition to running the fan club shortly after the film’s tragic theatrical release, worked in the art department at Star Trek and often tried to incorporate props from the film into the Star Trek sets. They are both very knowledgeable about the making of the film, and share much of the content that is included in the feature-length documentary. Into the 8th Dimension (1080p; 128:16): To paraphrase President Widmark in the film, “I’m glad someone has the balls to give us the facts!” This is the documentary every fan of the film needs to see, that covers many aspects of the production (from inception to pre-production to cadting to principal photography to post production to release and beyond) and isn’t afraid to talk about the many problems director W.D. Richter and producer Neil Canton had with executives Sidney Beckerman and David Begelman over many petty things in the film, such as Buckaroo’s red glasses. Buckaroo Banzai Declassified (480i; 22:41): The tongue-in-cheek documentary on the making of the film (that doesn’t go into much detail) from the previous MGM DVD. Alternate Opening (480p; 7:12): The original prologue from the film, featuring Jamie Lee Curtis as Buckaroo’s mother. Deleted Scenes (480p): Taken from director W.D Richter’s personal VHS copy of the workprint. Backstage with the Cavaliers (0:53), Penny’s Troubles (1:20), The Conference Room (1:15), “Dr. Lizardo?” (0:43), “Give Me a Fix!” (0:37), A Little Down (0:33), “Therma-what?” (0:23), New Jersey Meets the Cavaliers (1:20), John Emdall (1:02), “Hanoi Xan?” (0:47), Penny Confronts Dr. Lizardo (0:45), “Solve These Equations!” (2:45), “A Piece of Cake” (0:42), and Illegal Aliens (1:06). New Jet Car Trailer (480p; 2:25): CG animation produced as part of a proposed pilot for a new Buckaroo Banzai TV series. Reversible Cover Insert: Choose between Scream! Factory’s new artwork, or the film’s original movie poster. Fans of Buckaroo Banzai will no doubt want this release in their collection, if nothing more than the new 2-hour no-holds barred documentary on the film. Recommended. Could be most of us collectors of sci-fi/horror already have this in our collection. I for one think this is one of those films that is so unique that whatever media it comes out as, you have to upgrade. I'll wait for the reviews before I double dip…it's that close…monkey boy! 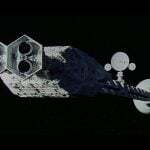 I saw Peter Weller speak earlier today at the Star Trek Mission convention in NYC, and he was asked about the movie. He said that while he was glad people enjoyed it, whenever he gets together with fellow cast members, they all have a laugh over the fact that none of them have any idea what the movie is about. Maybe you had to be there but I thought that was pretty funny. So has the Fox logo been restored to this or not? Nope. Starts with the MGM lion.